Editor’s note: In October 2018, Sr. Michele Vincent Fisher, CSFN, shared this reflection with our Associates of the Holy Family. At the end of this piece, are questions, prepared by Sr. Michele, to draw you deeper into reflecting on what hope means for you. A frail little girl kneels below a large picture of the Czarna Madonna (Our Lady of Czestochowa) and looking confidently at Our Lady she cries: “Be my Mother!”[iii] Young Frances Siedliska, thinking that her own mother is close to death, makes an act of hope and entrusts herself to the Mother of God, confident that her heartfelt prayer will be answered. Anyone who asks, receives! Surely, you can look at the context of your own life and recall a time when you made your own act of hope – as you birthed a child or watched a beloved parent, friend or spouse take their final breath; as you sat on your living room couch waiting for your teenager when he or she missed curfew; as you stood in line at the unemployment office or waited anxiously in the doctor’s office for test results. While hope often comes in the midst of trouble and suffering, it also comes in moments of joy and peace -- the first rays of the sunrise, a baby’s first steps, a conversation where someone really listened, the smell of freshly baked bread or brewed coffee or snowflakes gently accumulating on your windowsill. Hope is so powerful and yet so elusive! Hope is never a static or passive thing -- it is active, dynamic, directive and life sustaining. It doesn’t leave us idle or drifting or directionless. Hope does not disappoint, but it puts us on the path of life and it yields results for those who are ready to risk. From the time Mother Foundress was a child, she recognized a certain sadness in her soul. While materially, she had the benefits of wealth and societal privilege, she remained unfulfilled, incomplete. The day the brown-robed Capuchin monk, Father Leander, paid an unexpected visit to her family home, hope walked through the door and into her restless heart. “Would you like to learn how to love Jesus?”[v] The question was seared into her heart and ignited a flame that would last her entire life. From that moment on, Jesus was her one and only desire and his holy will her only aim. Upon receiving Jesus for the first time in Holy Communion, young Frances made sure that her heart would forever be the abode of this dear Guest of her soul. As Mother Foundress grew in her relationship with Jesus, she renounced her wealth and worldly allurements. During this time of great trial in her life, she tried to make it clear that she was not rejecting the love of her family nor did she attempt to persuade them to adopt her ways. Even when members of her family, especially her own father, persecuted her and referred to her as a “religious fanatic” or “overly scrupulous,” she always defended her love and respect for them. [vii] Often, when we hear the word “renounce” we equate it to the word “reject.” Renounce is to re-announce -- to see and experience something in a new light. What young Frances was doing was holding up her life in light of her deepening relationship with Jesus and re-announcing what was of greater value to her. This, of course, did not happen instantly or overnight. Her efforts were clumsy at times and embroiled her in many a family argument or reduced her to painful tears and even physical illness and suffering. Many trips to the confessional resulted in renewed efforts to understand her changing values and the prominent place of her relationship with Jesus above and beyond all else in her life. Hope encouraged her to stay the course, to live into the mystery of her call, even when the path ahead of her was dark and filled with obstacles. Instead of taking the path of personal devotion and interior holiness, Mother Foundress’ entire life becomes a public manifestation of the work of grace in her soul, and through her full gift of self to God, the Church and the world are enriched with the spirit of Nazareth. Certainly, you and I are not necessarily called to such a large-scale project, but nonetheless, each of us is called to radical conversion. Radical means “from the root.” If we are faithful to the invitation of God to entrust our entire life to Him, then each of us, in our own way, leaves an indelible mark on the world around us. Imagine if we could see for just a fleeting moment the impact of our daily choices and actions on the world around us. What would we see? One of the greatest struggles we face today is the ability to have healthy, sustainable and life-giving relationships. Mother Foundress herself, although materially wealthy, struggled with a mother who was emotionally distant and physically ill most of her life, having to relate to various governesses and teachers who came to reside with the family and having to deal with the anger and frustration of her father who rejected her religiosity and couldn’t understand her rejection of all that society could have afforded her. Childhood friends were few. When given the opportunity to befriend Jesus, love began to blossom in her heart. Placing her hope in the Lord, Frances learned how to see and love others through the lens of Christ. 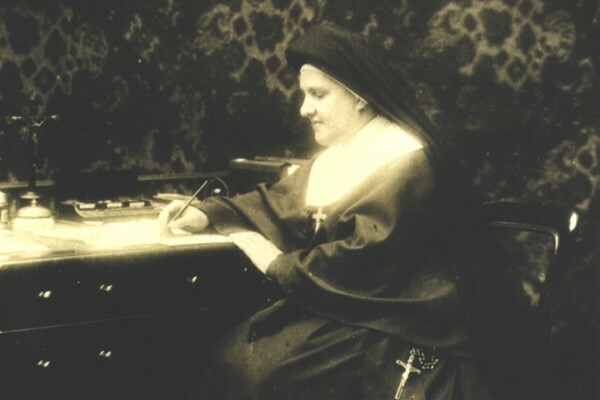 In her own words she states: “The affection we entertain for one another must have its foundation in God and must lead to an ever greater and deeper union with Him.”[viii] (Letter 1 to Mother Gabriel, 1877). With this premise guiding her relationships, she was able to give fully of herself while at the same time maintaining places in her heart that were for God alone. Like our Blessed Mother, her heart was pierced with many sorrows, but she pondered these things in her heart and shared them only with her confessor or spiritual director. She knew how to set clear boundaries yet still enjoy deep relationships. Mother Foundress had no need to manipulate or control others or to persuade them to need her. She was free to enjoy each person for who they were. Her advice? Living in hope is a tall order! The great Saint Augustine tells us that “Hope has two beautiful daughters; their names are Anger and Courage. Anger at the way things are, and Courage to see that things do not remain as they are.”[xi] Blessed Mary of Jesus the Good Shepherd possessed this kind of hope – a hope that engenders courage, a hope that can work past the anger and frustration of present realities, and a hope that transforms from within. The blessing of this kind of hope produces joy and peace in the midst of swirling chaos and uncertainty. It offers protection under God’s watchful eye and sheltering wing when we turn to him in trust. It engenders strength, courage, and boldness in the face of fear and doubt. It gives us confidence in the ministry we are called to perform and ultimately it gives us comfort and confidence in the face of death. Mother Foundress lived this kind of hope and encourages us to embrace life with this same Gospel hope. What do you dwell on in the depths of your heart? What causes unrest within your spirit? What do you need to turn over to the infinite Mercy of God? How does hope help you to see yourself and your life differently? Have you ever renounced (“re-announced”) something in your life -- a relationship, a way of thinking or acting, a pattern of behaving, or an attachment to things? What did it cost you, personally? How did it affect your personal freedom? How did it give you hope and draw you more deeply into God’s love? Can you identify in your own life something which has shifted within you as you look at your choices, behaviors, decisions and activities in light of the “eternal” and not only this passing world? Consider your most significant and impactful relationships. What sustains these relationships? What tests or jeopardizes them? Where is Christ in your relationships? What do you need to mend? What is the risk you are being called to take today? Is it a leap of faith or just a few baby steps in the right direction? Where is God in the midst of this call? What is the next “right thing” you need to do? What hope do you hold onto as you look toward the future? [ii] Paulus, Trina (1972) “Hope for the Flowers” Paulist Fathers. [iii] Siedliska, Frances (Mother Mary of Jesus the God Shepherd) (1997) “Blessed Mary of Jesus the Good Shepherd: An Autobiography” Sisters of the Holy Family of Nazareth, Pittsburgh, PA.
[iv] Siedliska, Frances (Mother Mary of Jesus the Good Shepherd) (1976) “Counsels from the Heart: Extracts from the Intimate Letters of Spiritual Guidance and Religious Formation” Sisters of the Holy Family of Nazareth. Rome, Italy. [vii] Siedliska, Frances (Mother Mary of Jesus the God Shepherd) (1997) “Blessed Mary of Jesus the Good Shepherd: An Autobiography” Sisters of the Holy Family of Nazareth, Pittsburgh, PA.
[viii] Siedliska, Frances (Mother Mary of Jesus the Good Shepherd) (1976) “Counsels from the Heart: Extracts from the Intimate Letters of Spiritual Guidance and Religious Formation” Sisters of the Holy Family of Nazareth. Rome, Italy. [xi] Saint Augustine of Hippo. [xii] Paulus, Trina (1972) “Hope for the Flowers” Paulist Fathers.